Are there assets that are not subject to probate? Why do I need a living will? Can't my spouse make those decisions for me? Why do I need a health care surrogate? What determines if Medicaid will pay for my nursing home care? Your estate is, simply, everything that you own. An estate consists of your investments such as stocks, bonds, mutual funds, annuities, bank accounts, and certificates of deposit; your retirement accounts such as individual retirement accounts and 401(k) plans; real estate; and life insurance policies. It also consists of your “stuff”-furniture, appliances, jewelry, collectives, and all the other items of personal property. The value of your estate is the value of all of these assets, less mortgages and any other debt. In its most basic form, estate planning is the process of planning for the management and disposition of your assets and resources when you are deceased or no longer able to manage your own affairs. Most people think estate planning is just worrying about assets or minimizing income and estate taxes, it is really much more. Estate planning is really about accomplishing your goals during your life and beyond. Estate planning is not about how much wealth you have accumulated, it’s about whom and what are important to you. Take as an example a widow with two grown children who has only a house and $200,000 from a life insurance policy on her late husband. Does she need estate planning to protect herself and her two children? To some people, $200,000 isn’t a lot of money. Even so, the widow wants to be assured that she can live in comfort in her own home. What if her son has an alcohol problem? Wouldn’t she worry that he will just drink up whatever amount she leaves him at her death? Wouldn’t she feel better leaving money to him in such a way that it could be used for his rehabilitation? It's not whether you have an estate that requires planning; it's whether planning will provide you with a sense of comfort and well-being about your and your family's future. A last will and testament is a legal document designed to tell the probate court what to do with your assets at your death. To be valid, a will must comply with the laws of the state where you live. For example all states require a will be in writing and that there be a certain number of people who witness the signing of your will. The requirements vary from state to state. If you fail to meet your state's requirements, your will may be invalid. A will only governs the distribution of property that is left in the deceased person’s name at death. If property passes to a new owner at death, for example by a beneficiary designation or by joint tenancy with right of survivorship, than that property is not in the deceased person’s name at his or her death. It is therefore not part of the probate estate and is not governed by the provisions of the will. A will guarantees probate. A will generally has no validity until after your death and after it has been submitted to, and accepted by, the probate court. A judge will decide whether the will conforms to state law, and if the judge decides the will is valid, then the judge will order that it be admitted into probate. In a sense, no person can die without a will. Even if you have not created one for yourself, the laws of your state specify how your property is distributed on your death. The state essentially writes a will for you. These laws are referred to as the intestate succession statues, and a person who dies without a written will is said to have died intestate. These laws distribute your property to your family based on their relationship to you. The process of distributing your property is supervised by the probate court, much the same as with a will. It is poor practice to rely on these statutes for your estate planning needs. With a will, even though it will go through probate, you control to whom, when, and in what portions your estate is distributed. Yes. Probate can be avoided with assets that allow a beneficiary designation such as life insurance, annuities and retirement assets such as IRAs, 401ks, etc. A Revocable Trust is perhaps the best way to avoid probate. It is a written legal document that creates an entity to which you transfer ownership of your assets. A trust ownership is a form of ownership where the legal title to assets is held by the trustee of the trust for the beneficial enjoyment or use by the beneficiary or beneficiaries of the trust. A revocable living trust is a trust created during the trustmaker’s life, and the trustmaker retains the right to amend or revoke the trust while alive. While the trust maker is alive and competent he or she can serve as the trustee and is the primary beneficiary of the trust. A living trust contains the maker’s instructions for what is to happen to the trust property when he or she dies. A living trust is a will substitute. Unlike a will, a living trust also contains instructions for what is to happen if the maker becomes disabled or incapacitated. However, the trustmaker do not lose control of the assets once they are transferred into the trust if the trustmaker is names as the trustee. Avoid probate. As long as all of the trustmaker’s assets are funded to the trust, a revocable living trust avoids a death probate, which, among other benefits, results in privacy and lower administration costs. Should you own assets in more than one state, it will eliminate multiple probates. Plan for disability. If the trustmaker becomes disabled, the successor trustee takes care of the trustmaker’s affairs according to the instructions in the trust. There is no need for guardianship proceedings. Control property during life. Because the trustmaker is both the trustee and the beneficiary of the trust, the trustmaker retains the same control over the property as he or she had before transferring the property to the trust. The trustmaker is free to do as he or she wishes with the property, and there are no worries about a co-owner’s creditors or whether the property will end up in the hands of the wrong heirs. Control property at death. The trust controls the property at the death of the trustmaker, and the trust contains the trustmaker’s instructions for what is to happen to that property-whom it goes to, how much, and when. It can also provide creditor protection for beneficiaries. Peace of mind. Knowing that you have taken care of matters and that your family and loved ones will not have additional burdens at an emotional time. Also knowing that you and your loved ones have been provided for. A durable power of attorney is written legal document by which the principal, you, appoints another person, an attorney-in-fact, to perform specific acts on behalf of the principal. Generally a power of attorney grants the attorney-in-fact broad powers to deal with all of your assets and to take any action on your behalf. Traditionally a Power of Attorney terminates upon you, the principal, becoming incapacitated or when you die. However, a Durable Power of Attorney remains valid if you become incapacitated. To be a Durable Power of Attorney, the document must specifically state that it is to continue to be effective after you become incapacitated. A living will is a directive to your physician that states that you do not want "extraordinary means" employed to keep you alive should you be in a terminal condition or in a permanently unconscious state. This will not only relieve your family of the burden of applying to the courts to authorize stopping artificial life support but will also relieve your family from having to make this decision at all. In many cases, the answer is "no." Without written instructions from you to your physician to prohibit the prolonged use of artificial life support, your spouse may not have the right to act on your behalf. A living will contains specific instructions from you as to what action you want take or not taken if you are permanently unconscious or when death is imminent. It gives direction and purpose to your loved ones, instead of placing the entire burden on them to make these life-and-death decisions. A living will goes a long way to ease the burden and the guilt that a spouse or other family may bear as a result of having to make this decision without any direction or instruction from you. A health care surrogate is someone that you have chosen to make decisions regarding your healthcare, if for any reason you are unable to make them yourself. The health care surrogate is some one who you trust to make these types of decision. In many cases no one other than you can make your health care decisions. This includes spouses, siblings significant others etc. Without a written instruction in which you have named a health care surrogate the treating physician will proceed as they believe medically needed. This may or may not be your wishes. A health care surrogate will be able to talk for you. Under the Health Insurance Portability and Accountability Act your medical records are private and even your spouse is not entitled to access to your records. The authorization for release of protected health information is sometimes referred to as the HIPA Authorization or HIPA Release. This is a written document that designates who, besides yourself; you have authorized access to your medical information. These people can and usually do consist of you love ones, your personal representative, the trustees of your trust, including your disability trustee, and any and all successor trustees. A power of attorney for health care designates an agent to make healthcare decision for you for medical treatment whether death is imminent or not. A living will is a statement to the health provider that you do not want extraordinary means to be used to keep you alive. We always use a living will in conjunction with a power of attorney for healthcare. Elder Law is defined by the client to be served. 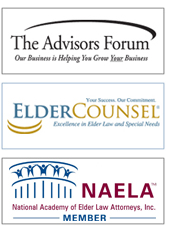 An attorney who practices Elder Law focus on the legal needs of the elderly such as address long term care and estate planning needs of each individual based on his or her unique situation and who can help them to protect their assets in the event of illness and dispose of their assets upon their demise, with a minimum of problems. >What Determines If Medicaid Will Pay For My Nursing Home Care? You are a U.S. citizen or eligible alien, a Florida resident, and at least 65 years old or disabled, then eligibility for Medicaid will be based on your income and resources (assets). Income includes but is not limited to: wages, Social Security benefits, pension, and Veteran’s benefits. Resources include but are not limited to: bank accounts, stocks, bonds, trusts, annuities, property, and life insurance. How your income and assets and the amount one can have and still be eligible for Medicaid is established by law. In addition, you will be evaluated to determine that you need the health care services provided by the facility. If a Medicaid applicant's income exceeds the lawful amount for Medicaid eligibility a Qualified Income Trust must be created with the applicant's income in order to create eligibility for long-term nursing home care benefits. This instrument is also called a Miller Trust. This is an irrevocable trust. The Qualified Income Trust must be properly managed and payments must be made each month to maintain eligibility. There are very specific rules that must be followed for the trust.